After a site upgrade, one of the largest oil and gas companies in the world used drone photogrammetry to survey engineering data assets. 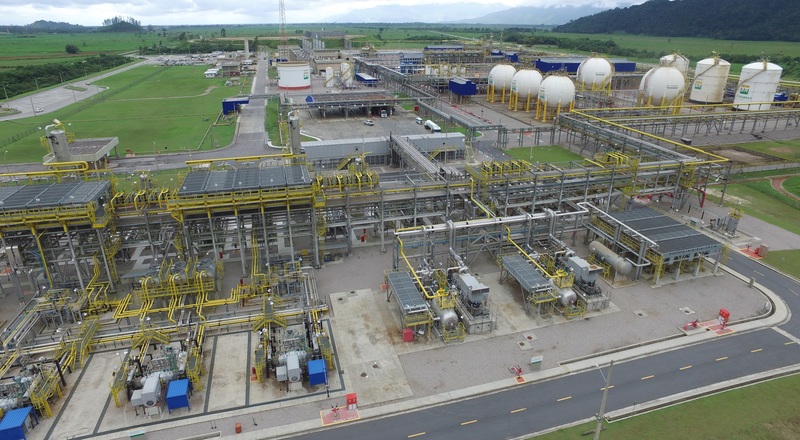 In 2016, a Petrobras gas treatment plant in Brazil, part of one of the largest oil and gas companies in the world, found itself stuck between two inspection methods after several plant upgrades. They needed a way to bring their engineering data assets (such as 3D models, drawings, databases) up-to-date, but laser scanning was considered too expensive and direct visual inspection too risky and time-consuming. In search of another alternative, they asked IATEC Plant Solutions Inc. to develop one. IATEC Plant Solutions Inc. introduced drone photogrammetric survey as a new method for surveying the change of assets. 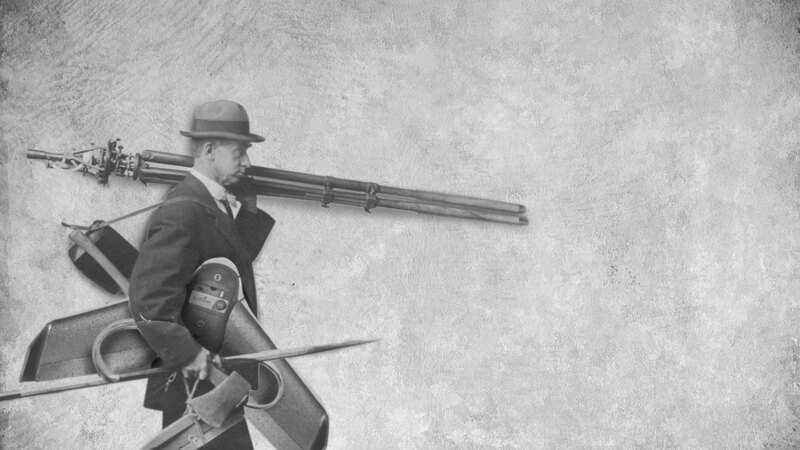 Cheaper, faster and more precise than traditional methods. Industrial Asset Management is the system on an industrial plant charged with protecting and increasing assets. The main objective of this project was to develop a field surveying method for large-scale industrial asset management that would be cheaper, faster and more precise than traditional methods. The results proved more efficient and economic than previous methods, providing impressive accuracy and models that overlaid perfectly with the existing 3D design. IATEC Plant Solutions Inc. introduced aerial photogrammetric survey via drone and ran a pilot project to prove its efficiency. In only three working days, a DJI Inspire 1, automatically driven by Pix4Dcapture flight planning application, collected a total of 2588 nadir and oblique images (nadir taken with grid mission and oblique with free-flight mission) from 10 sub-areas of the facility. In order to determine the best processing option, the images were processed in different software to check for quality, speed, accuracy, flexibility, configurability and usability. Gradually Pix4D emerged as the leader and was used from then on. How does drone mapping for inspection compared to other methods? Before IATEC Plant Solutions Inc. decided to use drones for aerial inspection, they considered direct inspection and laser scanning. How did these methods measure up? On the left image a worker is directly inspecting a girder and on the right the workflow diagram for that inspection. To send personnel for direct visual inspection is extremely time consuming. The workers are exposed to life-threatening hazards such as falling or even facing explosions when climbing the structures, and due to the complexity of the plant, it is difficult to access to all areas of interest. This traditional method not just takes a lot of time but is often considered low-quality. Manual errors could occur on field handbooks, and to redo the survey takes an inordiante amount of time. On the left image a worker is conducting a laser inspection and on the right a screenshot of the output. Laser scanning has been a commonly used method due to the accuracy it achieves and the shorter time it takes compared to traditional field survey. However, it still requires personnel to remain in risky areas for weeks or months. Laser scanning has limitations in measurement distortions and positions shifts as distances increases (because the technology is non-stereoscopic) and heterogeneous cloud density (too many point for regions close to the scanner but too few points far away), which causes burdensome processing and handling issues. The heavy load of the files resulted in small volume of processing, and the frequently occurred software errors lower the overall productivity. On the left a drone is capturing high resolution images of the oil plant and on the right a screenshot of the 3D model that was created. IATEC Plant Solutions Inc. developed the photogrammetric surveying method to Petrobras due to its low cost, accuracy and simplicity. In order to achieve the best surveying results during a week of time when the plant was shut down, the team planned ahead and picked the optimal drone, processing software, and the computing and storage resources. 750,000 square meters were successfully reconstructed within just three days using drone photogrammetric technology. As a result of the pilot program, IATEC Plant Solutions Inc. decided that drones and Pix4Dmapper photogrammetry software were the best tools for the job. Before actually going on site, it is critical to target which part of the plant to map and the number of layers that each region needs to be mapped to have the entire project done within the scheduled time. The drone flight plan for the 3D modeling of the oil plant. For this project, the team chose DJI Inspire 1 to collect images, videos and telemetry files because at the time of writing, the Inspire 1 is the most affordable professional-grade drone in the market and a very suitable solution for mapping. It is also extremely easy to fly, stable in windy conditions and extremely portable. Quality photos captured using the 12 Megapixel onboard Zenmuse X3 camera, combined with accurate telemetry data from both GPS and GLONASS satellite systems played an important role in the final success of this project. The use of the free drone flight planning app Pix4Dcapture, which is compatible with DJI SDK, enabled the Inspire to automatically fly routes that are optimized for 3D mapping. A DJI drone ready to takeoff and capture images for 3D modeling use. Pix4D software provides very impressive results. The team processed the images using four different software packages and eventually picked Pix4Dmapper as the preferred solution. One key difference was the processing time: one solution toook three days to process a region, while Pix4D processed the same images in less than four hours. Additionaly, Pix4Dmapper photogrammetry software can automatic classify point clouds using machine learning processes. Direct precise measurement in Pix4Dmapper (left) and changes noted on the new-generated orthomosaic (right). After using Pix4Dmapper, the team reported: "The features we especially like in Pix4Dmapper are flythrough videos, compatibility to our existing CAD/CAE tools, and configuration settings. The new rolling-shutter effect correction in the latest version improves the accuracy. Pix4D software provides very impressive results with easy (and very few) manual intervention in a short processing time." 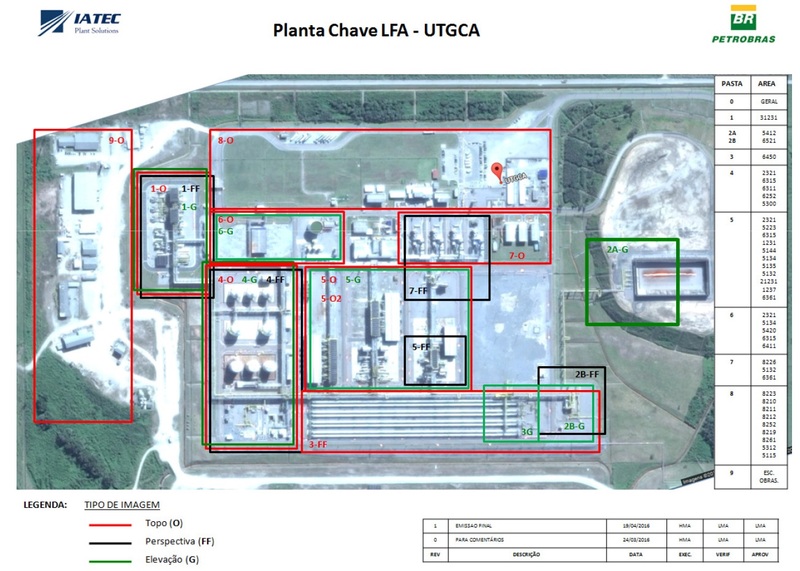 "Better than our best projections"
The results surprised both the IATEC Plant Solutions and PETROBRAS-UTGCA teams. The IATEC Plant Solutions team reported: "Not even in our best projections we could imagine that the whole work would proceed so fast and so smooth as it happened. The orthomosaic generated for each sub-region and the original images proved a precise way to highlight engineering document inconsistencies." "The 3D reconstruction showed a fast way to check for plant detail which was never displayed in the 3D project models and 2D drawings. 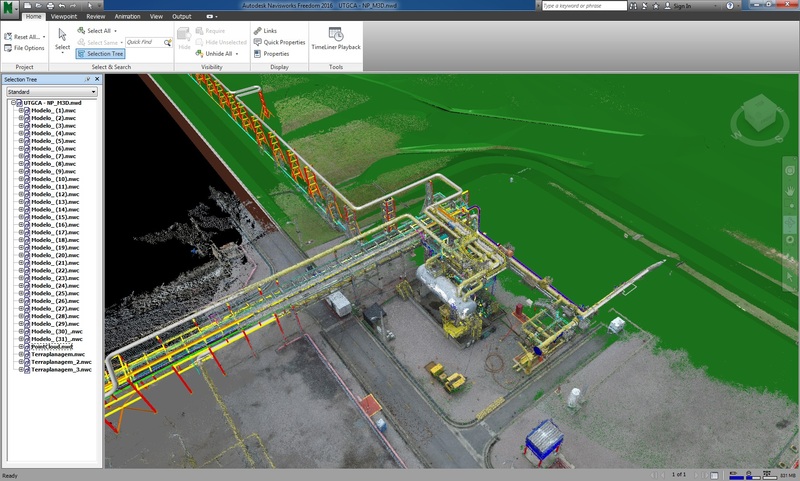 The Pix4Dmapper photogrammetric 3D point cloud can be imported into 3D review tools such as Autodesk Navisworks and compared to the existing 3D models in order to show inconsistencies, rearrangements and displacements." 3D model of an industrial asset created by images captured by drones. In the near future, IATEC Plant Solutions plan to apply the new technology for regular updates. More studies and training will help achieve a complete 4D data storage and simulation. 3D model of the gas plant created by aerial images captured by drones and Pix4Dmapper photogrammetry software. 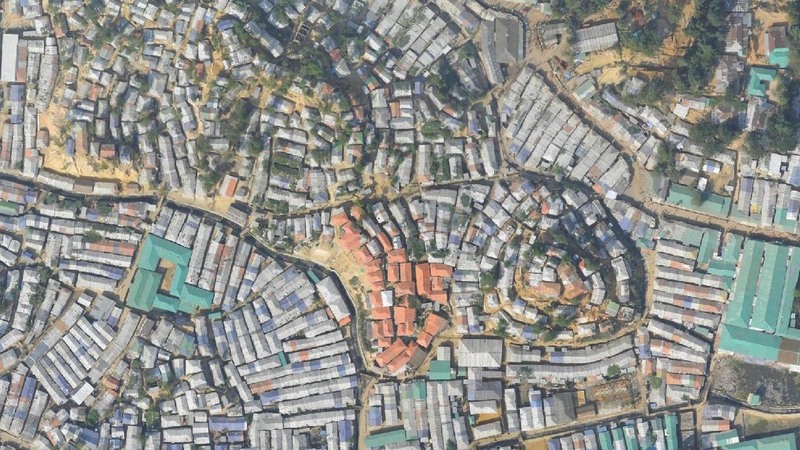 High-resolution up-to-date maps help prevent and mitigate disasters for half a million residents of the world’s largest refugee camp. 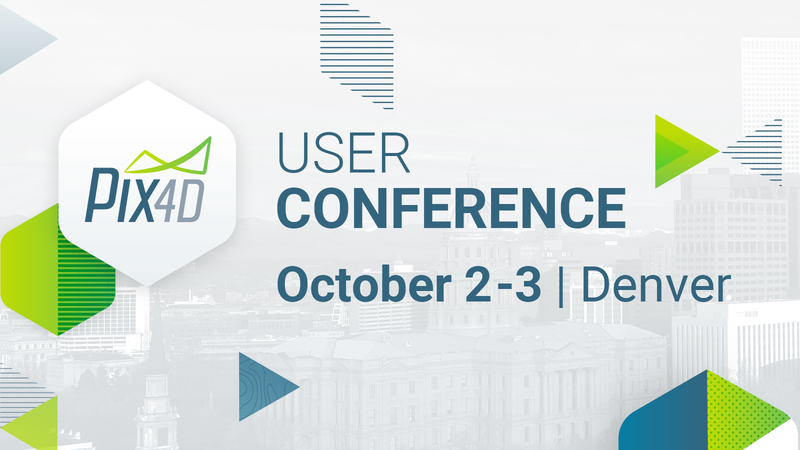 Registrations for the Pix4D User Conference are open! Hint: it’s all about quality.